We provide the highest-quality roll-up signs and stands available in a variety of styles and colors (Mesh or Vinyl) with standard highway legends or emergency messages (see below). Or they can be custom made, with your own silhouette-style logo, design and wording. (Screen set-up charge applies to custom legends). All of our roll-ups are light-weight and designed for visibility, durability and flexibility with limited storage space in mind. Available colors include Non-Reflective Fluorescent Orange, or Reflective Orange, Yellow, White, Yellow-Green (Lime) or Pink (Coral). They come as diamond-shaped 36- or 48-inch signs or Red-and-White octagons (for STOP signs) and rectangles for other construction-related messages, such as Black-on-White for ROAD CLOSED signs. You can choose any standard message and color combination. Our roll-up signs are designed for fast set-up and take-down and compact storage. Each is manufactured with quality vinyl sheeting made by Reflexite or 3M, the largest makers of roll-up sign material in the world. Every roll-up sign comes with a pair of strong, solid Orange fiberglass rib supports (1/4 to 3/16-inch thick and 1 1/8-inch wide) and can be attached to sign stands we offer, or to any other manufacturer’s sign stand with roll-up sign brackets. training exercises and emergencies. 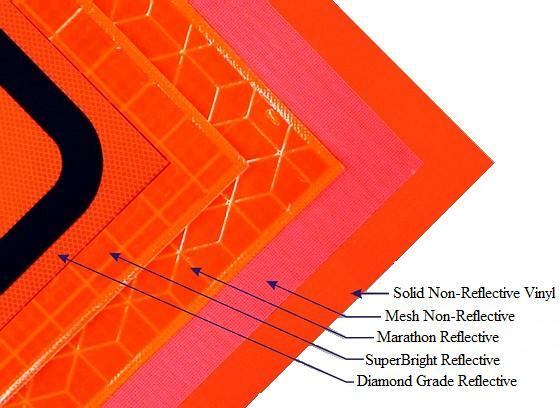 These Coral-colored signs are made from durable and flexible reinforce microprism retroreflective sheeting, and meet criteria set by the federal sign manual, MUTCD. Vinyl-coated Non-Reflective Fluorescent Orange nylon with open-weave mesh. For day use only. Durable 18-ounce re-inforced vinyl in Non-Reflective Fluorescent Orange. For day use only. Reflective for day or night use. Available in Fluorescent Orange, Yellow, White, Lime (Yellow-Green) or Pink. Durable vinyl with Gray backing. Durabe Reflective vinyl designed for day or night use. Available in Orange or White. Comes with Gray back. Extra heavy-duty Reflective vinyl for day or night use. Available in Fluorescent orange for high visibility. Includes Gray backing. letters for symbol-type signs. Custom messages and symbols also available with one-time $75 screen-setup charge.